Put each of the books in the Bible at your fingertips. 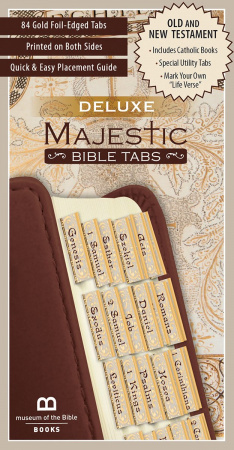 A total of 84 elegant foil-edged tabs are designed for Old and New Testaments, as well as tabs for additional books found in the Catholic Bible. Also includes a selection of special tabs for marking your own Life Verse, concordance, and more. Design derived from The Psalter in the German Translation of Martin Luther.